This relentless sweet tooth of mine has discovered the thrill of a snack that’s actually pretty healthy! 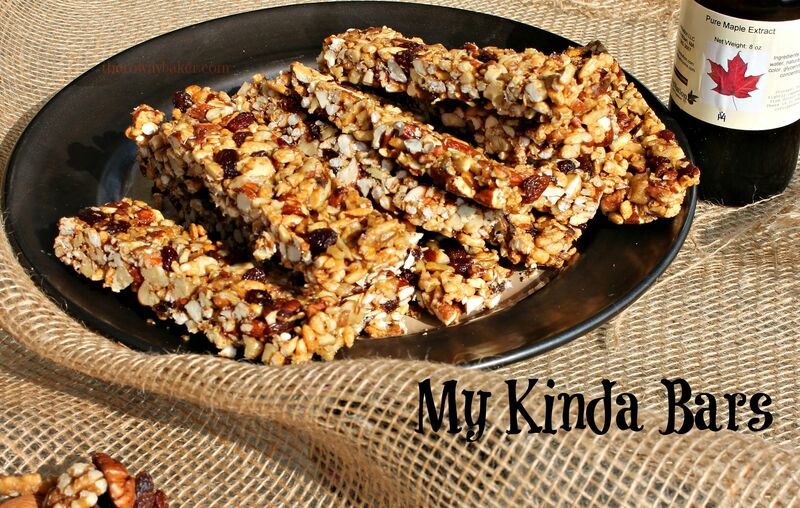 I love Kind bars, but find it hard to fork over the money for them, so of course I had to try to make my own. I tried lots of different methods, but ultimately (of course) went with the one that had the most steps. It just turned out so much better it was worth the extra time. 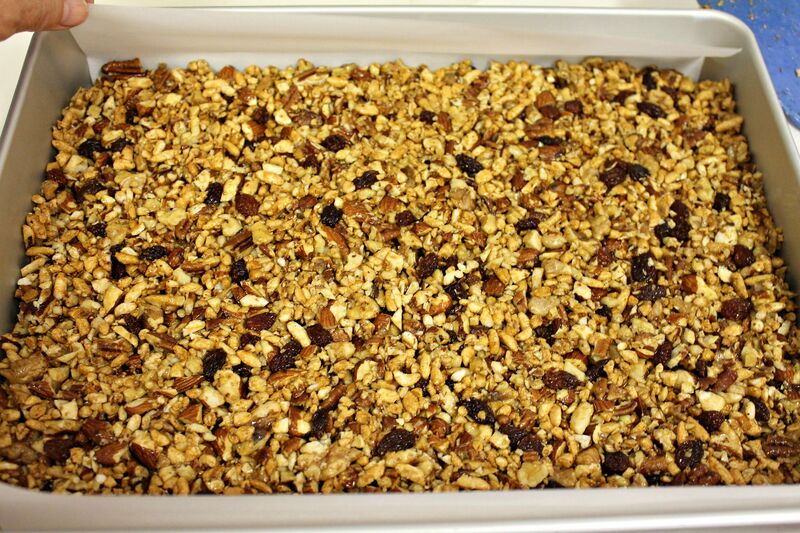 By tossing my nuts and cereal in boiled syrup and then baking it like caramel corn, the bars glued together perfectly and didn’t have a pool of crunchy sugar on the bottom. Not that I have anything against a layer of crunchy sugar…but you might. 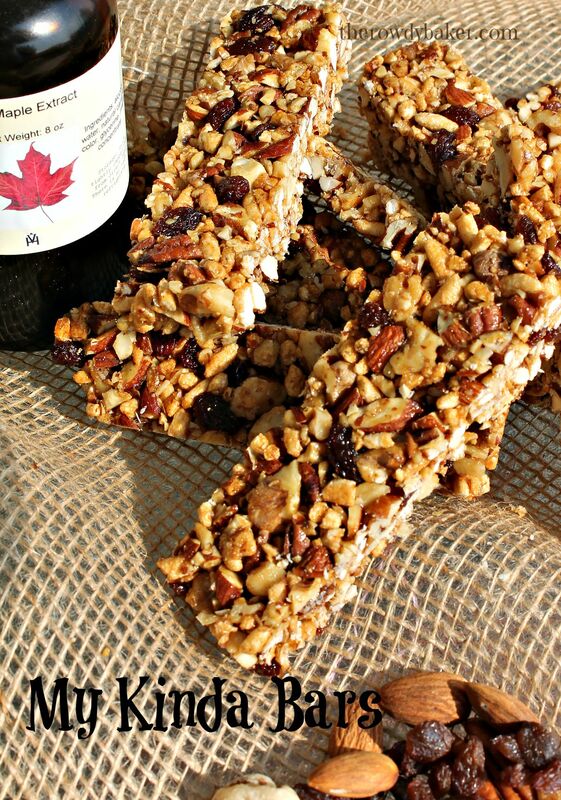 I used honey and pure organic maple syrup when making these, since both are a little lower on the glycemic index than processed sugar. 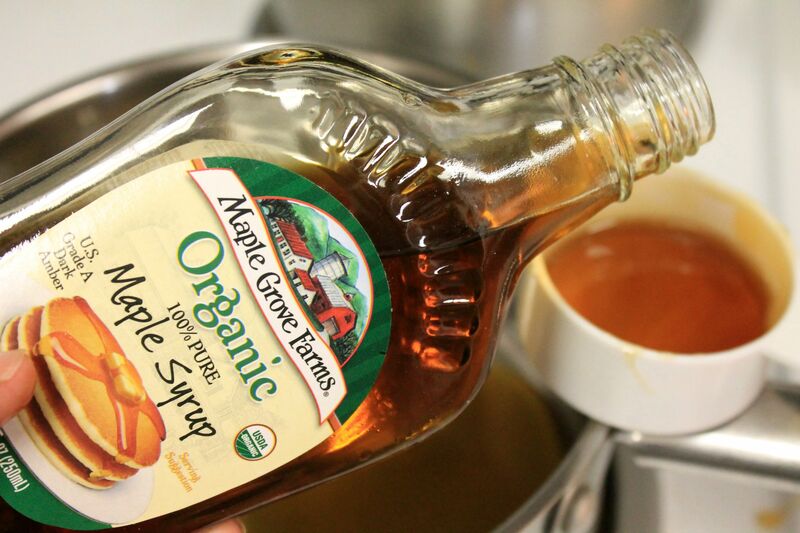 If you’re watching your sugar intake and want to go lower, you can substitute brown rice syrup for the maple syrup. I’ll be making them with maple sugar soon, but realize that not everyone has easy access to that – so this was my compromise. 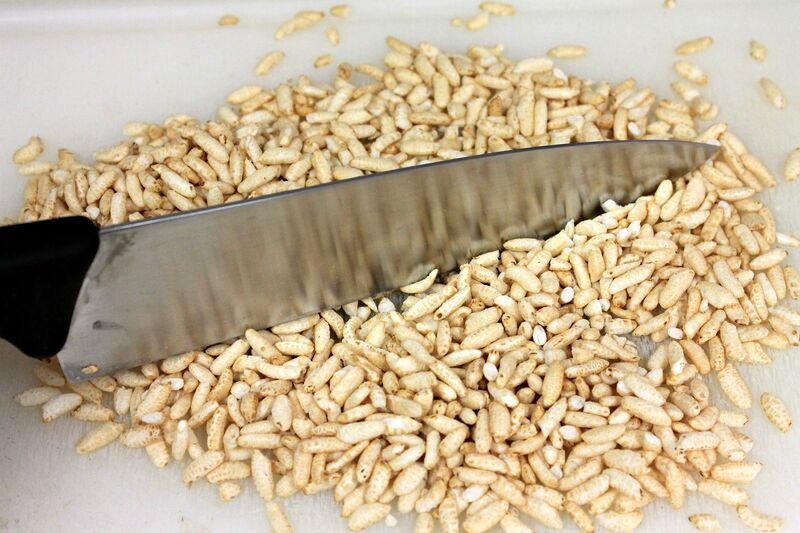 Nuts, raisins, and puffed rice are held together with just enough sweet syrup to do the job. That’s it! I think these are perfect for those moments when you are in a rush and have to grab and go; you’ll be amazed by how satisfying and filling they are. Oh, and in case you make these and think that hiding them in the freezer will keep you from munching uncontrollably, fuhgeddaboudit. They’re delicious frozen. I know this. This particular recipe is for maple Kinda bars. 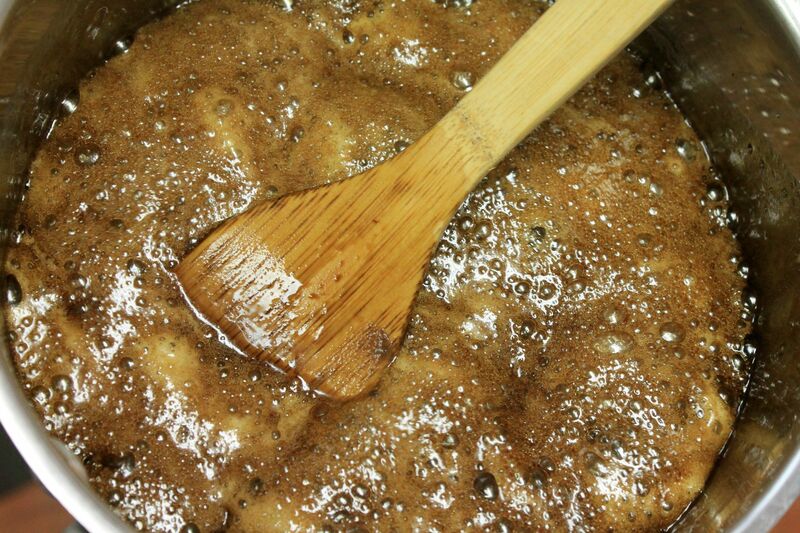 If you are using a maple flavoring like Mapleine, you may be able to cut the amount of flavoring back to one tablespoon, but I used pure maple extract, which doesn’t seem to be as strong, so it took two tablespoons for a mild maple flavor. 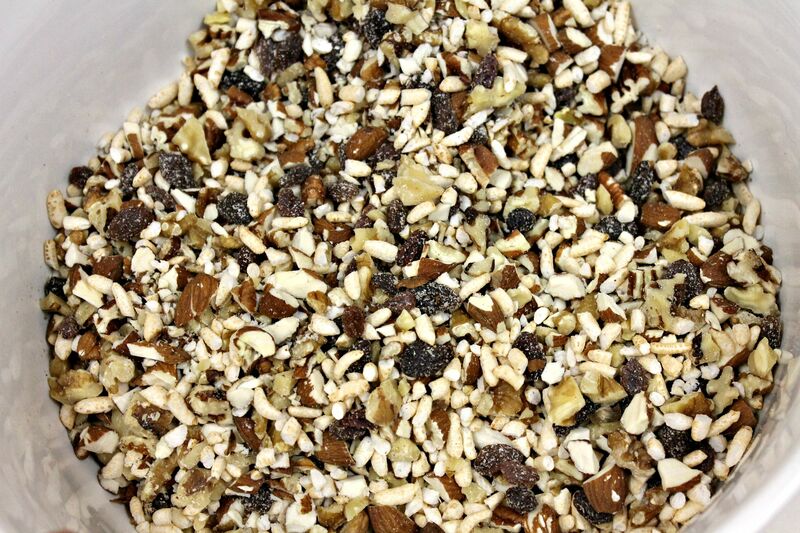 Adjust these any way you like, as long as you keep the basic ratio of four cups of nuts to two cups of cereal. Cashews are very good, as are hazelnuts (if you like them.) I’m not a fan. If you don’t love maple, use vanilla instead. A dash of cinnamon is nice, too. I have a distrust of parchment, so I butter mine before pressing the mixture into the pan, just for insurance. If you have more faith than I, you can skip that step. Press the mixture into the pan firmly. One way is to place a piece of parchment over the top and press with your hand. If you aren’t willing to risk pain, you might want to wait a few minutes for it to cool down. Cut when the bars are solid but still slightly warm. This will keep them from crumbling at the edges. Chopped rice puffs help the bars hold together better. 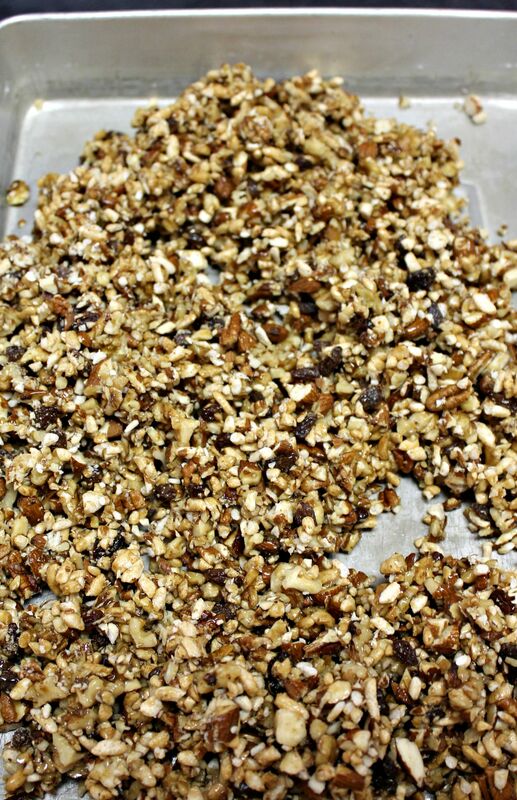 Combine chopped nuts, raisins, and rice puffs. Lightly spoon into greased baking pan and bake. Press firmly (!) into lined pan. 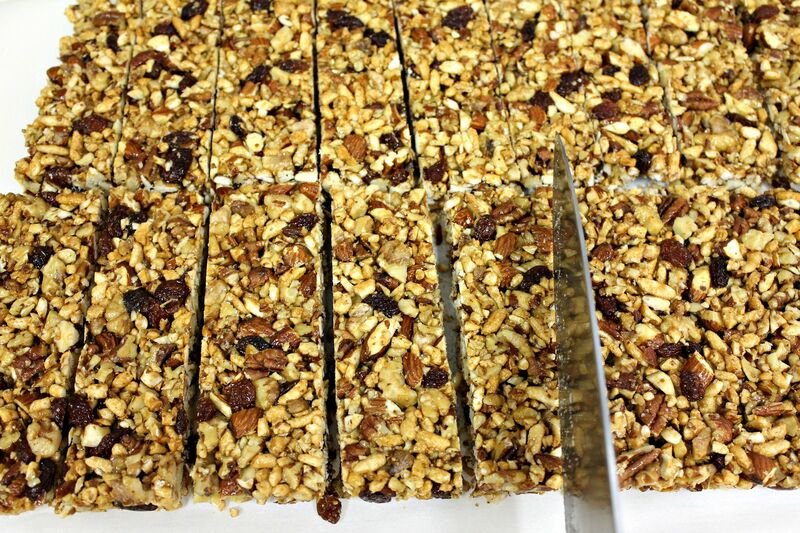 Cut into bars – whichever size you prefer. If you know me at all, you know that my mind is already going a million miles an hour, thinking of variations that I would love. Peanuts, almonds, and raisins drizzled with dark chocolate. 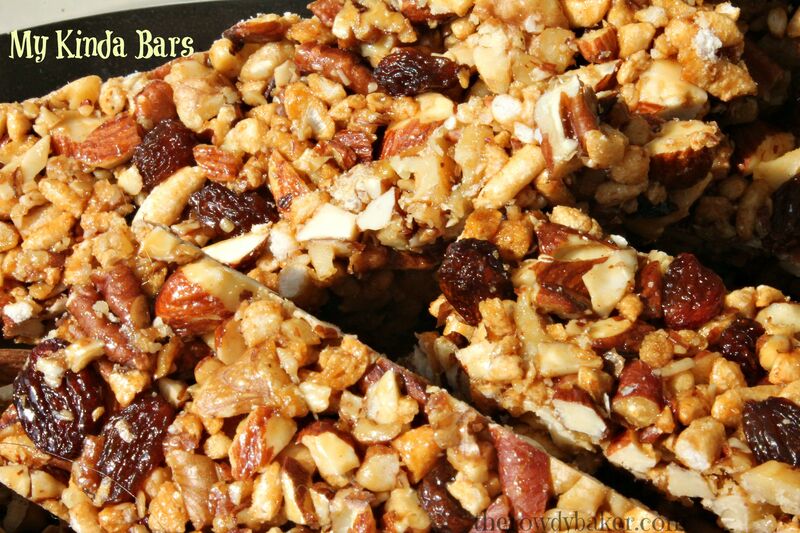 Cashews, almonds, pecans, with a cup of dark chocolate covered raisins stirred into the baked mixture before it’s pressed into the pan. I’m certain you have some great ideas, and I’d sure love to hear them!